The Future's Rosie: I'm (kind of) standing – yeah! yeah! yeah! This is likely to be the last post of this year before it's tools down and chilling out for Christmas. Two fairly major events have happened since I last wrote and seeing as they are both really positive it seems like a fitting way to end what has been a fantastic year for Rosie. 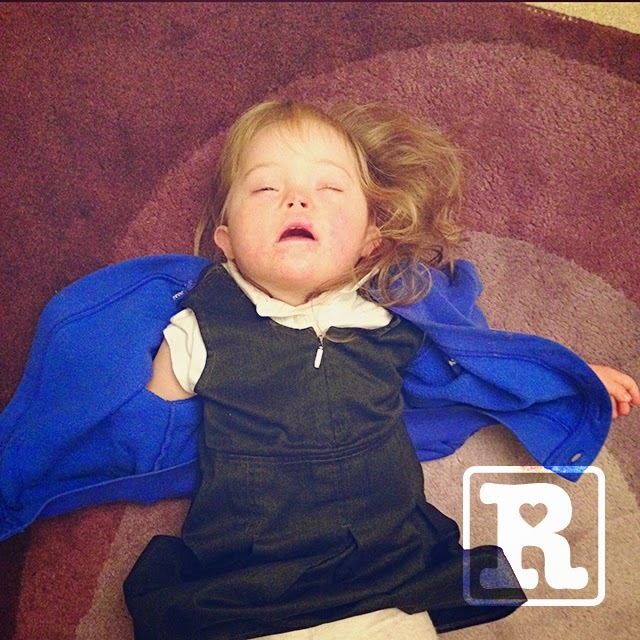 Rosie started mainstream nursery in September and as I've expressed in previous posts one of my biggest concerns has always been whether she will be included and accepted. One of the most amazing things I find when I see Rosie amongst her peers at nursery is just how accepting all the kids are. I dare say they may even be beginning to realise she is a little different as she has a one-to-one for starters and is unable to run off and play with them on her own. Any physical differences in Rosie's appearance don't seem to have any impact on the other children where they may be unsure or even frightened. There seems to be a natural instinct amongst a few in the class to gravitate towards her, perhaps even mother her slightly. It just goes to show that prejudice really is something taught to children through society and we could learn a lot by watching the unpolluted innocence of children interacting. I seem to have gone off on a tangent somehow trying to paint a background picture – although it does tie in! Now it may not seem like a big deal but to me it meant the absolute world. I couldn't stop smiling – this was my daughter, who I feared may be excluded in the early days of diagnosis, being well and truly INCLUDED. It's difficult to explain the elation upon receiving it on Rosie's behalf and I dare say it was a fairly insignificant moment to Demi herself as she was merely asking her friend to a party – standard stuff for a three year old, however to me it was a very significant moment indeed, one of immense pride and also relief that Rosie is being embraced by her classroom peers. 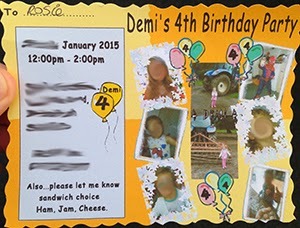 In fact since receiving this invite Rosie has had another one too which falls on the day after so she has a weekend of partying to look forward to! The second event happened last week when we were at a friends house and all the kids were having a bit of a boogie (okay maybe the adults too). Rosie was busy bum shuffling about waving her hands and arms in perfect time to the beat which only magnified my own lack of rhythm! A short while later one of the kids noticed Rosie sneaking off into a larger space and shouted, "Look at Rosie!" We all glanced over and there she was, stood up on her own two feet. She must have been there for a good 10–15 seconds and she'd got to her feet unaided too. We all cheered and clapped which of course she loved! It was a lovely moment to witness and one which we can now build on. As people often remind me when I get anxious about her lack of walking – Rosie will get there it will just be in her own time and on her terms! I'd like to take this opportunity to thank you all for your support, words of wisdom and for helping spread the word that Down's syndrome really is nothing to fear. It's been a fantastic year with so much achieved, from facing my own fears of public speaking by delivering a talk to over 200 of Mencap's top staff, a double award at this years MADS and the honour of being invited to join Mencap in the Lord Mayors Parade which even included a live interview on BBC One! These have all been amazing opportunities to get a positive message across about the reality of raising a child with Down's syndrome. Rosie is exhausted from such a great year and is looking forward to a long rest! Wishing you all a very merry Christmas and a wonderful New Year! Rosie and family, I know everyone needs a good rest…especially those little ladies who do so very well in nursery school, and are now becoming such social divas! I, for one, will certainly miss you during the family down time…but please know that I will patiently await that lovely smile and news of all of the adventures you, and your family have enjoyed over the holidays. And much love for the New Year.